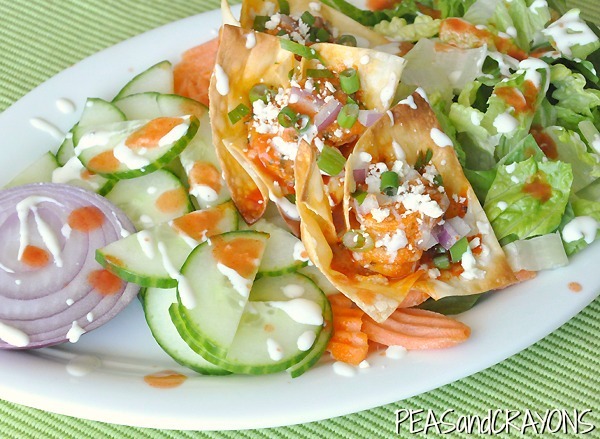 These Buffalo Shrimp Won-ton Cups make a rockin’ party appetizer! Spicy buffalo shrimp are loaded into a crunchy won-ton cup and baked to crispy crunchy perfection. Serve them up as snack or make them a meal by topping a salad with these loaded won-ton cups. My love affair with veggies is pretty apparent, [ya think!?] so it makes sense that one of the first questions I’m always asked is how my darling husband feels about vegetables. “That poor man… is he absolutely starving to death?” “Are you forcing him to be a vegetarian?” “Do you let him have meat?” That last one is my favorite. Of COURSE I don’t let my husband eat meat. He eats his veggies or he gets the hose. I’m an excellent wife, I assure you. 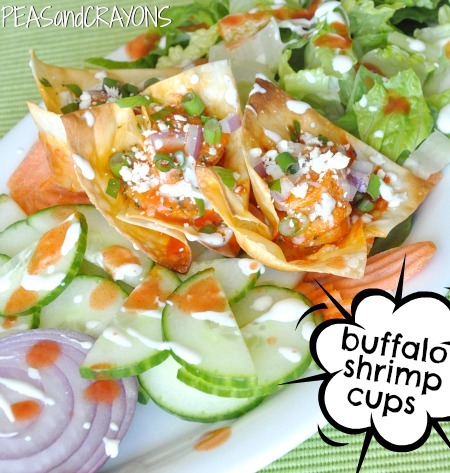 These Buffalo Shrimp Won-ton Cups make a rockin' party appetizer! Spicy buffalo shrimp are loaded into a crunchy won-ton cup and baked to crispy crunchy perfection. Serve them up as snack or make them a meal by topping a salad with these loaded won-ton cups. You're going to freak over how fast this one is. Preheat oven to 365 degrees Fahrenheit. Defrost if using frozen, or do the "I-skipped-a-step!" happy dance if using fresh. Grab your favorite pan and saute your shrimp in a little bit of oil or butter [about 1/2 teaspoon or so! ], just enough so the shrimp glisten as they cook. Season with 1/4 tsp garlic powder and a sprinkle or two of dried parsley. Once the shrimp begin to sizzle, add your buffalo sauce and stir. After just a few minutes of simmering shrimp will turn peachy-pink and opaque. I yank mine from the stove-top just as they begin to turn, leaving them just slightly under-cooked. They'll finish the cooking process in the oven! Spritz your mini muffin pan with olive oil and line with won-ton wrappers to create cups. Spray lightly with oil once more and bake for 5 minutes. Remove from oven and spoon 2-3 shrimp into each won-ton cup. Drizzle a little bit of the leftover buffalo sauce over each cup and bake for 5-8 minutes or until golden brown and crispy. Top with a drizzle of ranch or blue cheese dressing and a small mountain of red onion, green onion, and crumbled feta and commence face stuffing. Of course you get bonus points for serving them with a big fat salad. Serve alongside a leafy green salad w/ cucumber. Gluten-free chefs: skip the won-ton wrappers serve the buffalo shrimp as a salad-topper! My workout partner-in-crime, Shauna, was raving about the Buffalo Chicken Taquitos she made for dinner a few nights ago and I’ve been thinking about them ever since. I didn’t have buffalo sauce so I grabbed a bottle of hot sauce and made my own. Turns out the one’s you buy in the store are made with “Butter-Type Flavor” anyways. No thanks. Use real butter. Big thanks to the pilot for the brilliant idea. When he was deployed overseas they put hot sauce on absolutely everything — including salads! Its a bit crazy how delicious this is. Between the creamy ranch and the vinegary hot sauce it was pretty much swoon city up in here. They’re best when enjoyed immediately but if you’re like me and serve friends/family before yourself, you get stuck with the cold ones. A few minutes in the oven/toaster oven will warm them right back up for ya! This is precisely what I had to do during my second round of recipe testing when I decided to take no less than 200 photos of my food. Please don’t Baker Act me, I do this for you. And because I’m gloriously obsessive-compulsive. The cool cucumber compliments the fiery sauce, while the green and red onion add fantastic flavor and crunch! The sauce is spicy, but not painfully so and all the flavors of the dish hold their own against the heat. Paired with a big veggie salad it makes a fabulously balanced lunch or dinner, or can stand alone as an appetizer or game-day snack! Or just eat them in flour-covered yoga pants in the middle of your kitchen like I did the following morning. I’ve made them twice already, and if P gets his way, you haven’t seen the last of them yet! 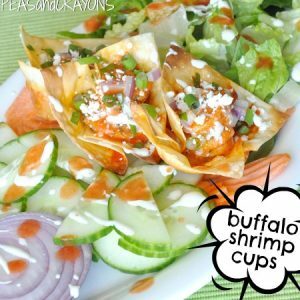 If you get a chance to try these Buffalo Shrimp Won-ton Cups, let me know! Leave some love in the comment form below or tag your photos with @peasandcrayons on Instagram so I can happy dance over your creation! How cute are these?! I love how they look and the colours, a great party idea! My husband is going to love these! They look super delicious! 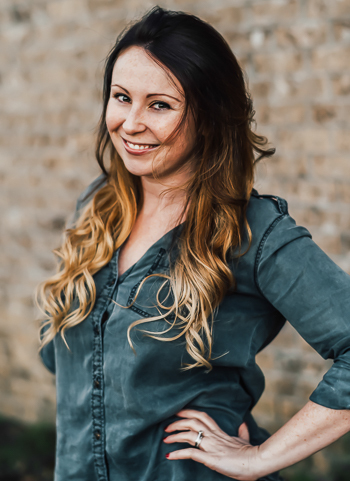 🙂 You are amazing Jenn! OMG, I get the same comments about my Hubby…it’s crazy. He looks great, but people assume he’s starving. Now if only I can teach him how to cut an avocado like Paul. These look amazing and plenty filling! Oh my goodness, this looks awesome. I’m sure my bf would love these too. Any food with the word “buffalo” in front of it and he’s in love. HA! I call my boyfriend “Pilot” on my blog too….and that looks like a recipe he’d also enjoy. Thanks. That looks amazing. I know my husband – Navy vet – will love it. I am totally going to make this, but instead of Frank’s, using my favorite, the One True Hot Sauce – Crystal. What an awesome idea!!! I like that there are only a few shrimp in each cup. I am weird about shrimp (which is ridick considering I’m from Charleston, SC!) so I can only handle a few at a time. This is pure perfection in my book! Whatevs. You’re clearly starving him. Love this one!! And I love putting hot sauce and ranch on my salads, too. It’s delicious! Thanks K! Go make these now!